Bridges — Extensive bridge experience in all types including freeway, marine, rail road, and complex, movable, and cable-stayed structures. Structural Retrofitting — Major bridges / trusses. 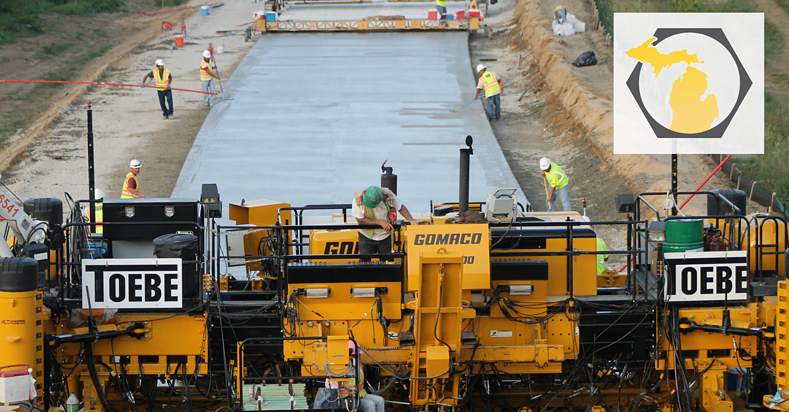 Mainline Concrete Paving — Interstate freeways, state highways, county and city roads, pavement patching, thin concrete overlays, airport runways and aprons. Approaching 100 years in business, Toebe is still building the transportation infrastructure that supports the economies of Michigan and Ontario. Continuing the traditions instilled by Walter Toebe himself, the company is carried out today as a third-generation family-owned and operated business. Toebe’s mission to deliver exceptional value and quality to the project owner, while maintaining a safe and positive environment for their employees, the motoring public, and the residents of the communities in which they work. Toebe is building a better Michigan in more ways than one: as a partner with Michigan Construction, they are helping to change the way that people connect with jobs in construction. Toebe Construction continues to grow and seeks committed and knowledgeable professionals to join the company. To learn more about jobs with Toebe Construction, click below.